Challenge for first place in each category and win great prizes! 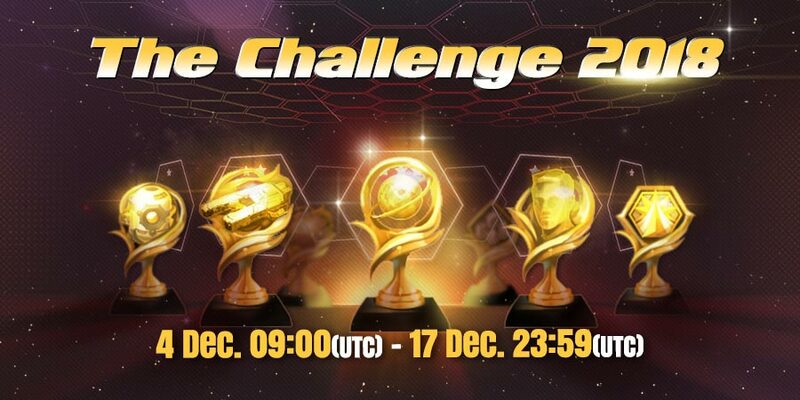 Challenge each category during the exploration event period and become the best in that area! The winner of each category will be rewarded generously in addition to participating rewards in each category, points are accumulated according to the conditions, and will determine the ranking. Record the most war victories during the period. Find the most alien fleet during that period. After discovery, only the alien fleet that has been destroyed is counted. Alien fleets with high levels are more valued than lower levels. Proceed with the exploration event during that period. Participation reward/conditions: 300 honor points for reaching the 5th map or further. During that period, the more Trons you will make with a Perfect Opter, the more points you will accumulate. All Trons are counted as one regardless of the rank or tier. Participation reward/conditions: 300 honor points for using more than 5 perfect opters. The more you use the Master Scout during that period, the more points you will accumulate. Regardless of the use of crystals, adventures, or purchases, the use of the Master Scout will give points. ex) 10 masters scout obtained from alien raid = 1600 Crystal Master Scout 10 times = 10 master scouts purchased = 10 master scouts purchased 10 times with 200 crystals. Participation reward/conditions: 500 honor points for using 15 master scouts or more. The more you spend crystals during that period, the more points you will accumulate. No matter how you consume the crystals, points will be accumulated according to the history stored on the server. Unintentional bugs, or points earned in an unfair way, will exclude you from this event. Points acquired in a dishonest way, might excluded you from the sum. Points will be added according to the actions recorded on the server. Points that are not logged on the server will not be checked and will not be checked. Both participatory and 1st place rewards can be obtained at the same time. 1st place rewards also can be obtained multiple times if a commander wins in more than one category. Ranking is determined across all servers. Based on data from 00:00 to 17:00 23:59 on December 4, UTC. Rewards will be paid within one week after the end of the event. When points are equal for more than one commanders, then the first one who reached that will be the winner. As a start of this event, there will be a log in bonus right after Dec. 4 maintenance. Please log in after the maintenance to collect log in bonus!